As I write this, Elliott is following our handyman around our house as Mario gently pounds nails into our walls. As Mario speaks 10 words of English and Elliott speaks 25 words of Italian, they make a quiet duo. Lena and I check on them every now and then in between eating Cheerios, ironing wall hangings and quilts, and wiping a runny nose. I've also been writing a loooooong grocery list in preparation for a shopping trip this afternoon. Elliott's staff are invited to our home for a potluck Christmas party this Thursday, and I'm covering drinks and desserts. So far I'm thinking apple pie, pumpkin ginger muffins, peppermint bark, decorated gingerbread cookies (or maybe these fabulous brownies? 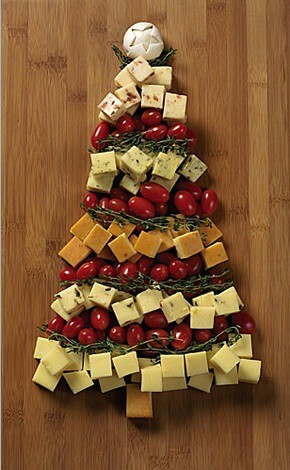 ), pretzel candy cane kiss candy, and definitely this fabulous cheese board! I'm excited, but I haven't often been the sole party hostess in my life. There's a lot to think about and prepare ahead of time! I'm searching the internet for various inspirations, party games, and wassail recipes. Do you have any tried-and-true desserts or Christmas party suggestions? I'd love to hear 'em! you should make mom's punch! (apricot nectar/orange juice concentrate). bagheera and i are just hanging out in my room right now. she is more hoppy today. 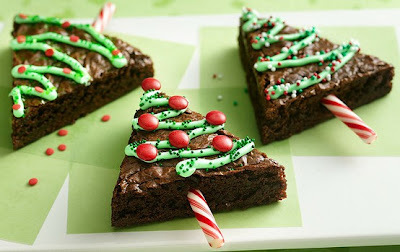 those are the cutest brownie trees! julia and i were just admiring them. are you going to give them a try? i know your guests will just appreciate being in your home no matter what they eat and will have fun as you will have welcomed them with open arms. Just had my Christmas party for friends 2 days ago. Of course, I am not a baker so had no part in the dessert process and can't help you there. Will this be an adults-only party or will children come too? Will you do a gift exchange? If you have kids coming, I can tell you about the Hicks family "Santa game" that we've played every year for over 50 years. Combine cranberries, cinnamon, water and boil until skins pop. Cool. Strain and and discard pulp. Add orange juice, lemon juice, and sugar. Serve hot. I haven't commented before, but it's been such a delight following your blog over the last few months! Have a wonderful Christmas! A crock pot (or soup crock) of apple cider is always nice for those that want warm drinks. Or mulled wine! Thank you for these very helpful comments and suggestions! The party was a fabulous success and I incorporated a few of your ideas. Can't wait to share photos soon!